Absolutely! There has never been a better time to add Hadoop skills to your resume. Let’s establish this with a few facts and examples. Have you ever wondered what’s the tech behind Facebook’s auto-tagging feature? How about surveillance cameras that are able to generate impeccable images even with low light? The answer is Hadoop and its ground breaking abilities to store, process and retrieve data. Storing data is one thing but processing and querying them is an entirely different ball game. If Big Data is a Rugby team, then Hadoop is the best quarterback you can find! Thanks to Hadoop, Facebook is able to store all the information about a person and points out the exact time and date of an activity on his/her profile. All the information about a person is Big Data and Hadoop helps render all of it. All the Hadoop data is stored on top of HDFS (Hadoop Distributed File System) which can house both structured and unstructured data. Competitors of Hadoop (such as RDBMS and Excel) can only store structured data. This is a major factor why Hadoop is the big daddy that is giving traditional data handling tools a run for their money. Hadoop does the processing near the data while RDBMS needs the data to be transferred over the network via the I/O to process the same data. Food for thought: Can Hadoop predict the outcomes of situation based on a data set? This graph shows the exponential growth of data over the years. Give it a closer look and you will notice that unstructured data accounts for 90% of all the data in the world. Simply apply the principle of demand and supply, and we can realize that more and more unstructured data floating around only gives rise to professionals who can fix this data. That is reason enough for a person to look for a job dealing with unstructured data aka Big Data. Have no doubts whatsoever that this is the right time to learn Hadoop. In reality, how effective is Hadoop compared to RDBMS? Hadoop knocks any other data handling tool straight out of the park. RDBMS and Excel may be efficient in managing data not exceeding a few hundred Excel sheets, but what about a thousand such files that need to be maintained? Let’s go back to the Facebook example again. The data log containing activity details of a Facebook user cannot be stored in Excel, at least not all of the historical data of a user dating back to decades. Also, in Hadoop data can be loosely structured but RDBMS requires the data to be more consistent and in a recognizable format. Take a look at the comparison between RDBMS and Hadoop and you will know for yourself which fares better. 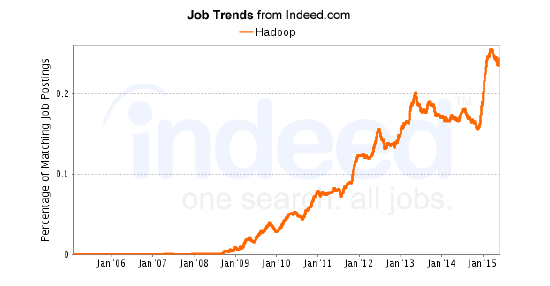 I have one final statistic for you which will seal all doubts on whether Hadoop is a good career choice. This graph is an illustration of the growing demand for Hadoop professionals and it is only going to rise in the weeks to follow. Unfortunately, you and I can’t change technology. At best, we can keep pace with it and learn evolving technologies and become indispensable to our workplaces. It’s the right time to learn Hadoop and ride the Big Data wave. Do You Need Java to Learn Hadoop?